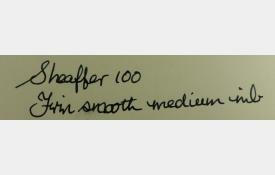 The Sheaffer 100 set is in the company's current product lineup, and this set appears not to have been used. 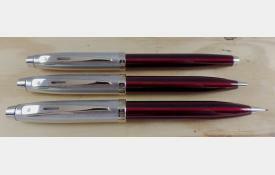 It contains a fountain pen, a ballpoint and a mechanical pencil. All are in mint condition. 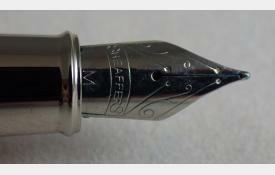 The fountain pen measures 14 cm capped. The barrel is deep metallic red and the cap is brushed steel with a nickel plated tassie, clip, cap band and end to the barrel. 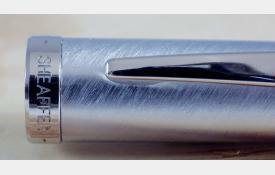 The section is nickel plated and the nib is a stainless steel medium. 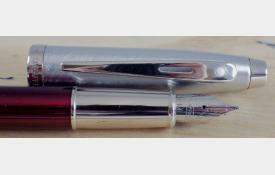 The pen is a cartridge/converter filler and the converter is fitted. The pen fills and writes well with a smooth, consistent medium line (see writing sample). 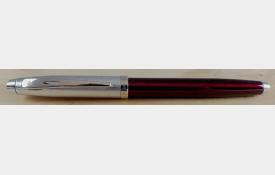 The pencil, in similar livery to the fountain pen, is in working condition. It contains lead and is operated by twisting the cap. The similar ballpoint pen is in working condition. The point is exposed by rotating the cap. 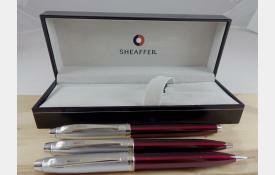 All have the famous Sheaffer "white dot". 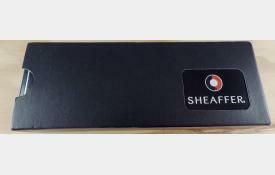 The hard shelled, hinged box is black with the Sheaffer logo. It also contains two Sheaffer cartridges and the accompanying paperwork. The box is contained in a black sheath.